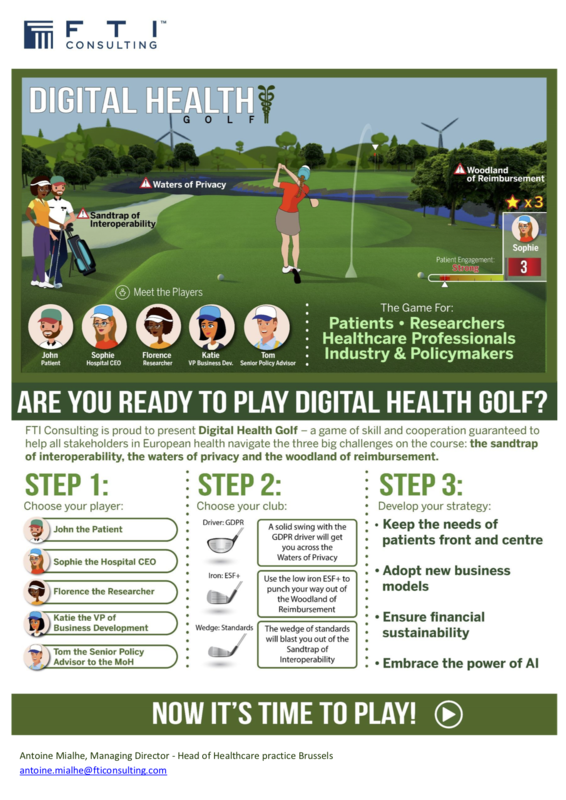 With the publication of the European Commission’s Communication on Digital Health in April, the course for digital health has been set – now it’s time to play Digital Health Golf! This is a game created by FTI Consulting Brussels for patients, researchers, healthcare professionals, industry and policymakers, who all must overcome three primary challenges for digital health: the sandtrap of interoperability, the waters of privacy and the woodlands of reimbursement and regulation. Fortunately, the players have a set of tools to get them through the course. These include the driver of GDPR, which can get them across the waters of privacy, the iron of ESF+, which will allow them to punch their way out of the woodlands of reimbursement, and the wedge of standards that can get them out of the sandtrap of interoperability.